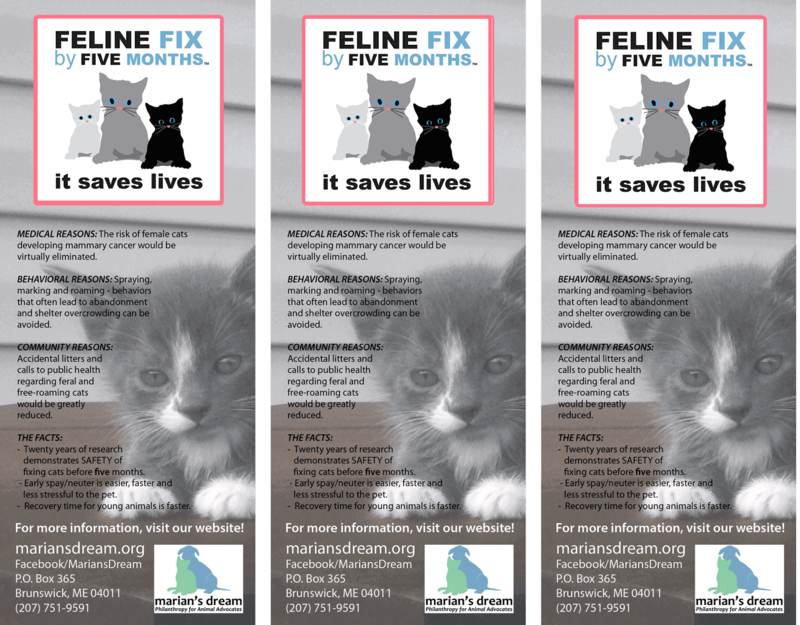 Why spay/neuter cats by five months? Recent research has revealed that cats spayed before their first heat cycle have a 91% lower risk of developing mammary cancer. The possibility of pyometria is also eliminated. Cats altered prior to first heat/sexual maturity (by five months) are far less likely to develop behavior problems related to hormones such as spraying and fighting, litterbox problems, roaming and howling. Cats not fixed prior to first heat/sexual maturity are far more likely to end up in shelters or on the streets. In fact 90% of cats relinquished to shelters have not been spayed or neutered. This could be related to #2 above – behaviors not tolerated in the home. Over 70% of cats relinquished to shelters are euthanized. Animals dumped often meet a slower demise on the streets, through hunger, disease, predation and other threats. Overpopulation of pets has community-wide implications including the difficult problems of complaint calls, animal care and control costs, and shelter overcrowding. Delaying the spay or neutering only increases the chance that unwanted litters will happen, and add to the community burden. For veterinarians, client retention is a factor. Young cats not spayed or neutered are at a greatly increased risk of being relinquished. For cats, who are at higher risk, veterinarians may wish to schedule the spay or neuter at the end of the kitten vaccination series, thus likely eliminating the problem behaviors that develop around the age of five months. Veterinary care for cats is on the decline: 45% have not seen a veterinarian in at least one year. Cats have little chance of being adopted once in the shelter system: 71% of cats never make it out of the shelter alive. Cats are being portrayed as environmental enemies: web sites and publications using questionable statistical models portray cats as decimating bird populations even though habitat destruction (by us) is a far greater threat. Cats are seen as “independent,” not needing care, left to roam and fend on their own. They have a high reproductive rate – and can produce three litters a year in some climates. What is my state’s Spay IQ? Does it have a well-run, publicly funded subsidy program for indigent people with pets? Do the veterinarians in your state routinely recommend spaying cats by five months or before their first heat? Are there affordable spay clinics and programs all over the state so all who need the services can reach them? Are there animal welfare groups that are helping promote the prevention of unwanted litters – or are they just reacting to a bad situation? Why have I not heard about Marian’s Dream? More recently have championed moving the age of spaying back four weeks as the default age – from six months to five months.